This week the valuation of cryptocurrency have lost $100 billion to a current market cap of $253 billion. Prices for most all the major cryptocurrencies including bitcoin, Ethereum, Ripple and Litecoin have dropped by +/-13%. Bitcoin has been taking a beating recently, and the cryptocurrency has now fallen below $7000 due to market speculation, regulatory concerns and FUD (fear, uncertainty and doubt). This weeks Twitter has announced its ban to allow cryptocurrencies and ICOs from advertising on the platform. Reddit, a popular cryptocurrency forum has stopped accepting bitcoin payments and the vice governor of the People’s Bank of China has said that they will crackdown on cryptocurrencies. Evan Van Ness has also tweeted that marketing email service provider Mailchimp would be closing all accounts related to digital assets. "Also, we cannot allow businesses involved in any aspect of the sale, transaction, exchange, storage, marketing or production of cryptocurrencies, virtual currencies, and any digital assets related to an Initial Coin Offering, to use MailChimp to facilitate or support any of those activities." With all these announcements, its not surprising that a wave of panic sellers have pushed to offload their cryptocurrencies. Bitcoin has lost over a $1000 in valuation; $ 6721.55 (@ 05:00AM/GMT) compared to $7623.71 twenty four hours ago marking this the lowest point in 51 days. Currently Ethereum is trading at $ 392.98 (@ 12:00APM/GMT) compared to $409 twenty four hours ago, representing a decrease of -3.44% and a market capitalisation of US$38.6 billion. 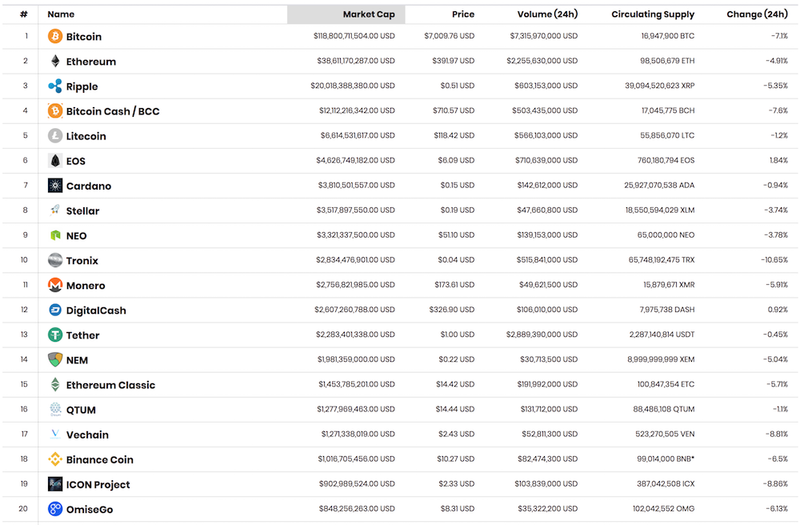 Ripple has had a bad week too with a current market cap of US$20.7 billion. Yesterday the token was valued at $0.52 (29/3 @ 12:00GMT) and as of midday today, it is being traded at $0.499 which is a decrease of -3.06%. Similarly, Litecoin has decreased in value and is currently worth $118.42, which represents a decrease of 1.2% in the last 24hours, a decrease of 12.84% for the week and a new market cap of US$6.5 billion. This week Charlie Lee, the creator of Litecoin apologised to the community because Litepay, a payment processor closed down its operations which obviously will have a negative effect.